Each tag contains a unique QR code and matching alphanumeric code. 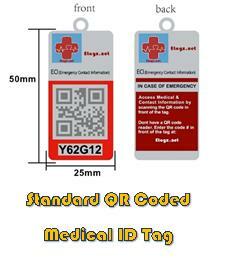 If the worst happens and you are involved in an accident and are incapacitated, first responders, who are trained to look for ETAGZ tags, can scan the QR code on your tag using their smartphone or tablet and your MEDWALL which has your Emergency Contact Information is displayed giving them the information they need to make faster and better medical decisions and to promptly contact your loved ones. Our tags speak for you when you cannot. 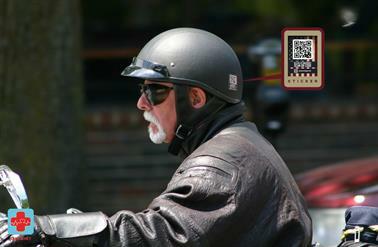 If they don't have a QR reader on their phone they can go to our web site at - www.ETAGZ.NET. In just a few keystrokes enter your unique code into our system and your MEDWALL is displayed. The unique code on your tag is linked to your personal Emergency Contact Information when you activate the tag. Only the information you choose to include is displayed. 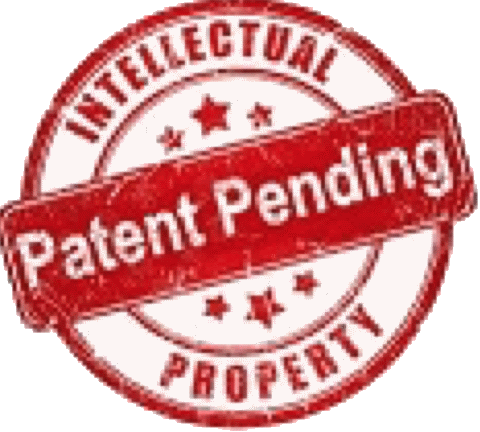 This is a very simple product, intentionally designed and created for ease of use with user friendly website to support it. It is designed to primarily provide FAST and EASY access for First Responders or anyone to be able to look up your MEDWALL within seconds to better assist you. Just check out below our MEDWALL Sample. All clients can choose their own specific information to be included in the MEDWALL and visible to the first responders and public. When a first responder scans the QR Tag this is the type of information that you can choose to appear on their phone or device. If the worst happens and you have an accident or are otherwise incapacitated, your Etag speaks for you when you cannot. When First Responders or Anyone scan the QR code on your Etag, they instantly get access to the MEDWALL you stored on your profile on our website. If they don't have a QR reader app on their phone, they can just launch their browser app and type in the simple URL: http://www.Etagz.net and then type in the unique reference found on the front of your Etagz tag. Yes, it is absolutely secure. All user account details (name, email address, gender, postcode, etc.) are held separately from the MEDWALL details. 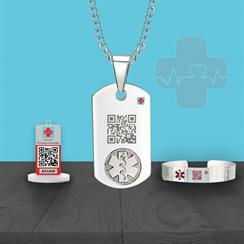 Etagz will NEVER provide, sell or in any way use your MEDWALL (Emergency Contact information) except to display your MEDWALL page when your unique QR code is scanned. We take data security seriously at Etagz.net. All our systems have been tested by outside security specialists. It starts with the unique QR code you see on the Etagz.net tag or sticker. The QR code contains an encoded URL or web page address. When the QR code is scanned by a QR or barcode reading app on a smartphone, the smartphone's browser is opened to the encoded URL - your MEDWALL. 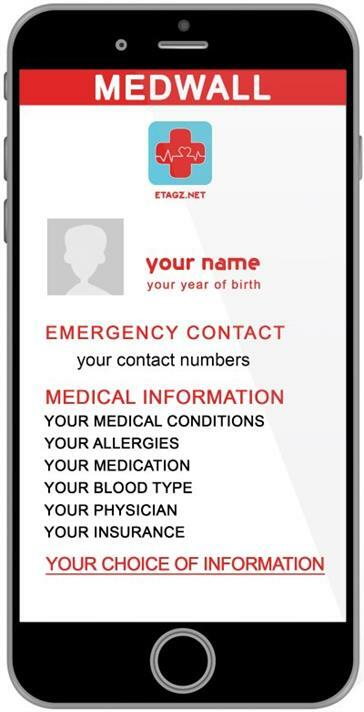 The Etagz.net system allows you to create a personalized MEDWALL. You decide what is and is not included. You might include a single emergency contact or you might have several. You might include information about food allergies, list of emergency medications you must have or other medical conditions that you want a first responder or anyone have if you are injured or in an accident and cannot speak for yourself. If you purchase the Tag for a family or friend who is disabled, elderly or otherwise not able to communicate clearly, we suggest you include their symptoms, medication and the contact information of the person who is their care giver. Once you save that information it is stored securely in our websites database. The information is NEVER given out or used in any way except to display your personal MEDWALL to first responders. After you enter your Emergency Contact Details, you activate your tag. 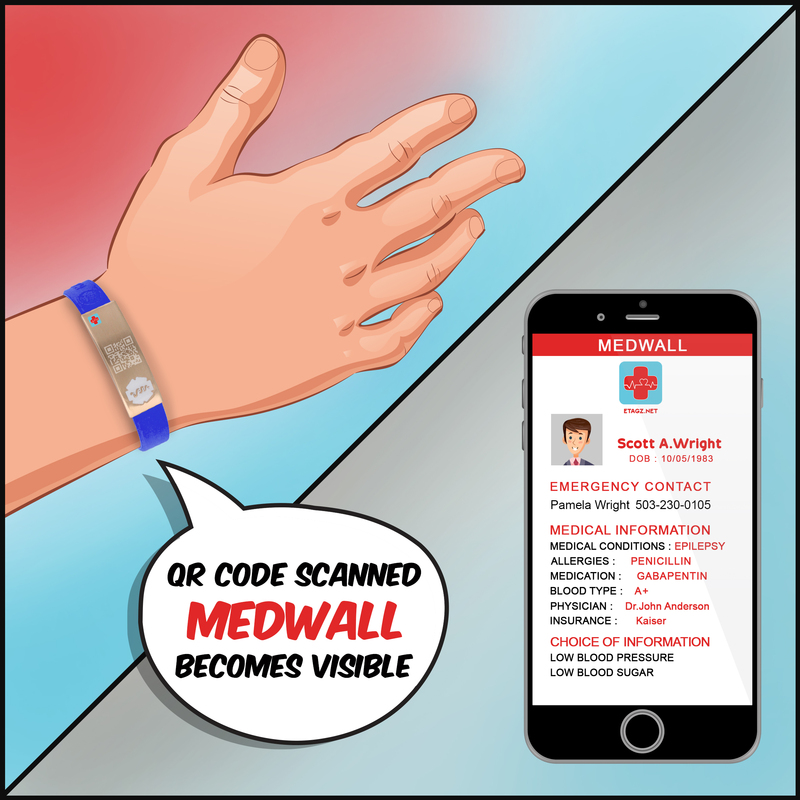 This ties the unique reference number of the tag to your MEDWALL Emergency Contact Information.